Utility for blocking the activity of keyboard monitoring programs presumably running on your PC. Neutralizes 66% of keyloggers, depriving them of information about the pressed keys. Keylogger Hunter was created, which paralyzes accumulation of information by Hook-based keyloggers. this software download is neither a detector, nor a disabler of keyloggers; it paralyzes the principle of keylogger functioning, based on Hooks. 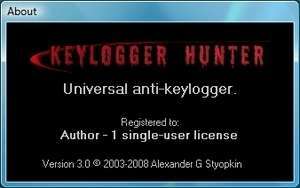 Keylogger Hunter 3.02 is a shareware program and can be used as a demo to try the software until the free trial period has ended. A full version of the program is available after the trial period ends. For security reasons, you should also check out the Keylogger Hunter download at LO4D.com which includes virus and malware tests. Additional screenshots of this application download may be available, too.